Did you know? Our online menus have ALWAYS been listed with tax-included prices on EVERYTHING! We believe that patients value up-front and honest numbers when choosing their medicine. Nobody wants to be surprised in the store! So while you might notice new higher menu prices of best-selling brands, keep in mind that these dollars are ONLY going to The Man – and we totally feel your pain! 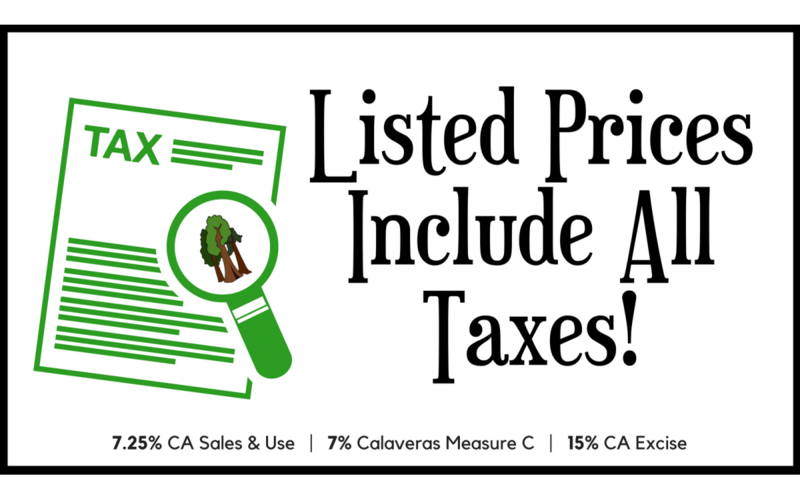 Calaveras County AND the State of California tax medical cannabis businesses so heavily, that 29 cents of every dollar you spend goes right to them. That is huge. And sadly, it’s out of our control. HOWEVER, you might have also noticed that our extensive flower menu still boasts reasonable price levels for any budget. We work with our closest vendors to ensure a full stock of medicine, and are fully confident in our ability to continue to provide those amazing prices indefinitely! With taxes and all of the other changes happening in California due to new regulations of the cannabis industry, these are surely interesting times for us all! We really appreciate your understanding and patience as we move into a new era! Stay tuned, spring specials and 4/20 are coming up SOON!